NTSB: Air Canada Jet Came Much Closer To Landing On Other Planes Than Thought : The Two-Way Investigators say the airliner trying to land in San Francisco could have caused a horrible disaster. Its pilots thought a taxiway with four planes waiting to take off was their assigned landing site. The top image is a map of the San Francisco airport created from Harris Symphony OpsVue radar track data analysis of an an Air Canada flight trying to land on July 7. The bottom image was taken from San Francisco International Airport video. Federal investigators say an Air Canada jet coming in for a landing in San Francisco last month came a lot closer than previously thought to hitting four other planes on a taxiway, in what aviation safety experts say could have been a horrible disaster. The National Transportation Safety Board says Air Canada flight No. 759 was just 59 feet above the ground at its lowest point, flying over a United Airlines jetliner waiting to take off, before the Air Canada plane pulled up, circled around and then landed safely. Investigators say both pilots on the Air Canada plane thought they were lined up to land on runway 28-Right at San Francisco International Airport on the night of July 7, and runway lights they saw to the left were from runway 28-Left. But 28L was closed and dark, its approach and runway lights turned off, except for a large, 20-foot wide, lighted flashing 'X' placed at the threshold; and the normal runway lights they said they saw to their left were actually from runway 28R. So even though they were cleared to land on 28R, the plane wasn't lined up to land on it at all. "Where's this guy going?" exclaims another pilot on the ground in a radio call to the air traffic control tower. "He's on the taxiway!" An air traffic controller tells the pilot of Air Canada 759 to go around and the pilot agrees to do so, when a United Airlines pilot chimes in, "United 1. Air Canada flew directly over us." The controller responds, "Yeah, I saw that, guys." The United Airlines plane, a Boeing 787 was the first plane waiting to take off after Air Canada's landing, and the new NTSB report indicates the Air Canada plane, an Airbus A320, may have come within just a few dozen feet of colliding with the United jet. According to Wednesday's NTSB investigative update, "Both pilots said, in post-incident interviews, they believed the lighted runway on their left was 28L and that they were lined up for 28R. They also stated that they did not recall seeing aircraft on taxiway C but that something did not look right to them." 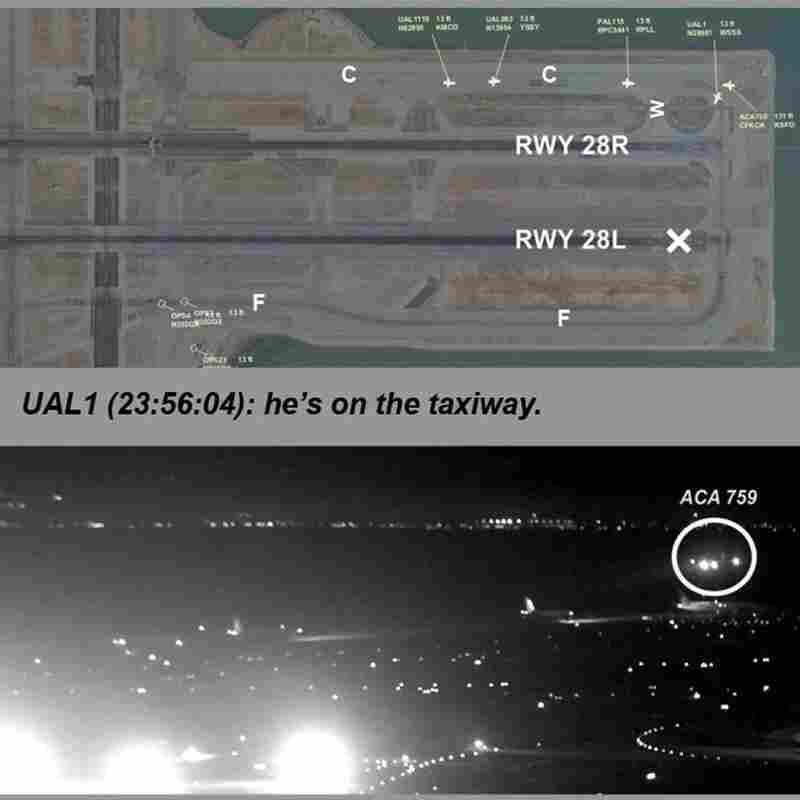 Investigators have not yet determined why the pilots mistook the taxiway for the runway, but the report indicates the taxiway was lighted normally, with blue lights to distinguish it from white runway lights.